This is the Norwesco Manhole Extension (24" H x 20" D). Failure to comply with the points below voids warranty. A. Tanks are not fire-resistant. Do not store them near an open flame or heat in excess of 180 F.
B. Do not install any tank under the path of vehicles or heavy equipment. C. Do not leave Low Profile septic tanks empty for extended periods of time. 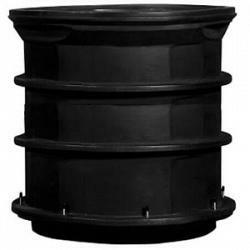 D. Low Profile septic tanks and cisterns are designed only for use as underground tanks. E. Low Profile septic tanks and Low Profile cisterns may be used as holding tanks or for pumping applications where permitted by local codes. F. Low Profile natural colored cisterns are made of resins that meet FDA specifications for the storage of drinking water and can be used for that application. G. Protect the tank from sharp objects which could puncture it and cause leakage. H. Where saturated soil or seasonal high water tables are indicated between the bottom of the tank and the ground surface, see separate Supplemental Installation Instructions on our website. I. For installations requiring counter-buoyancy measures; please refer to Counter-Buoyancy Instruction on our website. J. Maximum temperature of liquid entering tank is 120 F.
K. Maximum bulkhead fitting size is 4". It is not advised to use this plastic underground tank for any application other than typical household sewage. Such uses would void product warranty.